Grilled zucchini has a lovely smoky charred, meaty quality that’s just delicious—and it’s easy! Try this with any variety of summer squash, or even a mix. 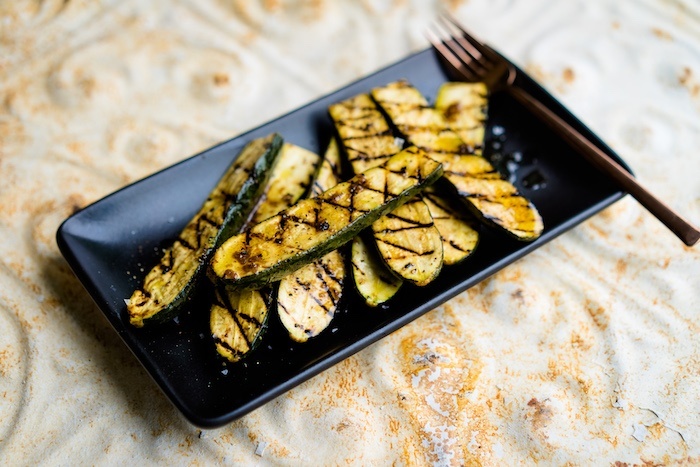 Grill up some extra to use in our Zucchini Salad with Lemon-Tahini Dressing. Halve zucchini lengthwise, if they’re small (about 6 inches). For larger ones, simply cut them into 6-inch spears. Combine oil and remaining ingredients, except flake sea salt, in a shallow dish. Add zucchini, tossing to coat. Let stand 10 minutes. Remove zucchini from marinade, reserving marinade. Grill zucchini 10 minutes or until tender, turning frequently. Transfer to a serving platter. Drizzle with any leftover marinade and sprinkle with flake sea salt.